Is the design of the city so bad that real road sharing isn't possible? Having run for the office of Regional Chair in the last municipal election I’ll tell you the best part of an election campaign is talking to people. You get a really good idea of who is engaging with the municipal government and what they are on about. For the purpose of understanding the points of view here I’m going to grotesquely lump people into two camps; the “car” faction and the “bike” faction. The car faction focuses on the incredible cost of housing, property tax and commute time they expend every day to live in Burlington. Commute time is adding to already full schedules and placing all sorts of pressure on them and their family. The commute time is stealing time with their kids, spouses, exercise, cooking dinner or just time to relax (if any exists) every day. Since the same problem afflicts half of the people in Burlington, would you not expect government at all levels should be primarily focused on cutting down this complete waste of time and resources? They believe in essence that the focus of government is to solve the problems of the citizens. Then there is the bike faction. Currently the amount of resources being used on the planet per year would require 1.6 earths of space to sustain this level of resource use indefinitely. If you could catapult every human to the standard of living of a Canadian then you would need 4.7 earths. If you don’t bring the level of resource consumption to one, then it’s some sort of displacement mixed with brutal starvation for a large numbers of people somewhere on the planet. They believe in essence that the focus of the government should be to limit resource consumption. Enter car vs bike. The car faction is trying to get around as quickly as possible in a city that was never designed for anything else. The bike faction is trying to get everyone to bike, because it’s got a favourable energy profile compared to cars. Enter the New Street “road diet” where you take lanes of traffic away. After the one year of study the outcome will be – drum roll – some increase in the number of people biking and some increase in the time it takes to drive down New Street. The car faction will declare the whole thing as idiotic as minimizing travel time is their priority. How can it possibly make sense to delay thousands of people for a handful of bikers? The bike faction will declare the whole thing as a success, because no matter how minimal the increase in biking – it’s an increase. A part of the second faction will even like the creation of snarled traffic – this more extreme position seeks to reduce car use by making it as unpleasant as possible. So how to get out of this mess? In my opinion goal number one is; don’t set these groups against each other. If you do the municipal government just endlessly swings from one camp to the other trying to seek some sort of peace. When traffic becomes hopelessly snarled beyond human endurance – then large numbers of people will descend on city hall and something will be done about it. Lanes of traffic will be added, though now awkwardly. When it’s manageable all sorts of groups bombard council with low cost utopian ideas of how to get people off the roads. 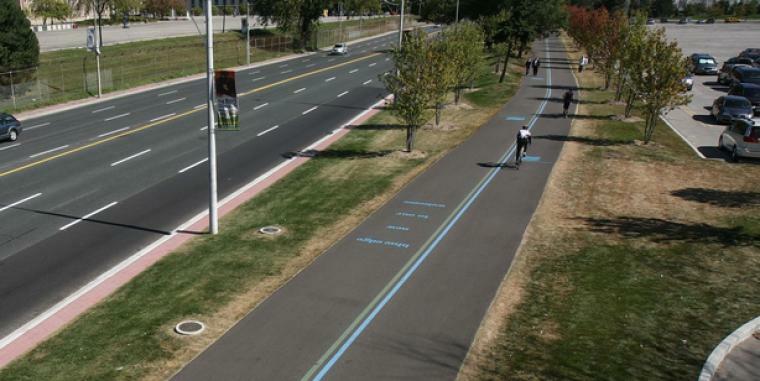 Proposed bike lanes being shown at a public meeting – the city went for a lane on either side of New Street from Walkers Line to Guelph Line for a one year trial period. For biking my preferred plan is still a 10 foot wide “roller path” with two oncoming 5 foot lanes for bike travel separated from the road. The best part of this plan is users get to live. Bikes on the pavement with cars exposes bikers to unnecessary risk. Spending money on such a path makes no financial sense as a method of transportation, but it’s an asset to the community. Even if you have no ability or inclination to bike, you still want best in class bike lanes because it splits the second faction in two. You will separate out the people who just want better bike access from the people who want the road system generally degraded. Right now the two groups are aligned. I see nothing in the current direction of Burlington that will not increase car dependency in the future. The distances in Burlington are impractical for walking, buses get snarled in traffic and the Official Plan puts localized mass transit densities off the table. Our new habit of knocking down most commercial space in the southern part of the city for condos and building large commercial blocks in the north cements car use like never before. We are not moving away from the “subdivision”. We have just invented a high density/parkless/treeless version of it. New developments are not designed to make a nice place to live, just warehouse people as cheaply as possible. What I am completely against is the government engineering a place where you are free to have a car, but the government tries to make it practically impossible to use it. At the core, that is what most of these new schemes are about. I’m all for best in class bike lanes and giving people that want to bike a safe place to do so. However, if it’s impractical, impossible or just unpleasant for people to bike and they decide to drive it’s the government’s job to accommodate them as well.